Recreational fisheries for steelhead are primarily catch-and-release, including the famed run of the Bulkley River, BC. The success of catch-and-release as a conservation tool is based on the premise that released fish survive and do not suffer any negative consequences. Science has shown, however, that angler behaviour can have dramatic influences on the outcome of catch-and-release angling, and that research is needed that specifically focuses on wild steelhead to identify opportunities for refining handling practices to ensure the best outcome for fish. Scientists on this project worked alongside volunteer anglers on the Bulkley River to study wild steelhead from Sept 2016 to April 2018. During this time, 126 wild steelhead were caught and used in one of two studies on the impacts of catch-and-release. Click here for a full summary of the project. Keepemwet Fishing and Bonefish & Tarpon Trust have teamed up to make the science that was presented at the BTT Symposium last November accessible to a wider audience. A selection of presentations have been summarized and “translated” into non-technical language that is easily understood by non-scientists. Several of the translations are below and more are available in the latest issue of the BTT journal. Catch-and-release is commonly used a conservation tool for fisheries. Whether it’s mandated or voluntary, it doesn’t take a rocket scientist to know that putting fish back in the water means that there will be more fish to catch tomorrow. However, catch-and-release is only effective if most fish survive and are left with no permanent impacts. Using best practices can help anglers achieve this goal. Best practices are actions that are often simple, and you have probably heard of many of them already, but together they have the potential to create better outcomes for fish that are caught-and-released. You can think of best practices as catch-and-release version 2.0. Often when fisheries scientists study catch-and-release they look at the varying aspects of an angling event and how each contributes to the overall impacts of catch-and-release on an individual fish or a population. Many parts of an angling event are in the control of an angler (e.g. hook type, duration of air exposure, how a fish is handled), while others anglers have less control over (e.g. water temperature, size of the fish). The science on catch-and-release has not been conducted for all species and all aspects of angling, so while we can sometimes apply general best practices across species, it’s also important to acknowledge that species specific and location specific difference do occur. While there are over a dozen studies conducted on bonefish (nearly all on Albula vulpes) catch-and-release, there has only ever been one study on tarpon and none conducted on permit catch-and-release. Table of the studies that have been conducted on catch-and-release (Sci) for bonefish, tarpon, and permit, elements of the angling event, and their priority for future research (P). Darker shades represent a higher priority. Some studies covered multiple elements of the angling event. De-predation refers to fish being attacked/eaten while on the line during the fight. Bonefish that roll or nose dive (called loss of equilibrium) are six times more likely be killed by sharks or barracuda after release. Air exposure is the main cause of loss of equilibrium. 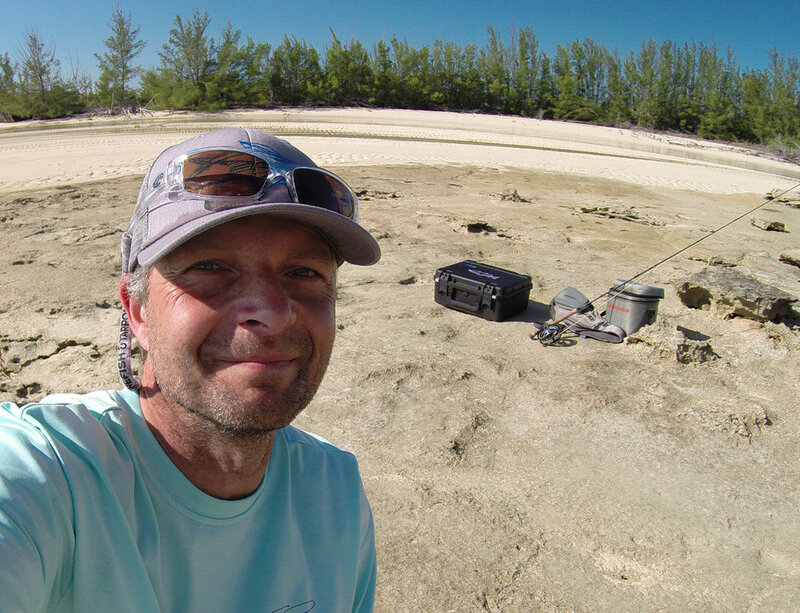 Air exposure is more detrimental to bigger bonefish and at higher water temperatures. Multiple studies on bonefish have shown that longer handling times increase stress levels in fish and can lead to poorer outcomes after release. Fish barbless hooks. If a bonefish is deeply hooked cut the line instead of trying to remove the hook. Don’t use lip grippers on bonefish. A study found that they can cause significant damage. Eventually, filling in the gaps in our understanding about how tarpon and permit respond to catch-and-release will enable us to create best practices for all flats fish. A special thanks to Ed Anderson who donated the artwork accompanying these summaries. Thank you to the presenters and their collaborators for the work that contributed to these presentations, and for allowing us to represent them in these summaries. Thank you as well to Natasha Viadero, Alora Myers, and Jordan Massie who provided assistance during the symposium. Click here to view article via pdf. Finsights #10 Lip gripping devices and your catch. Tiger fish. Dave McCoy photo. Sport Fishing Magazine recently published an article on A Guide to Lip Grippers. The very last paragraph of the article touches on how lip gripping devices can impact fish and the author states “Many of the lip-grip manufacturers interviewed independently stated that they believe their weight scales do not cause physical damage to fish or inhibit future feeding ability — when the fish is hung vertically”. I decided to dig through the scientific literature to see if anyone had looked at this at this and found only three studies that focused on lip gripping devices, each on different species. Bonefish The first study looked at if lip-gripping devices caused injury to bonefish. They compared bonefish held vertically in the air with a lip gripper to those held horizontally in the water with a lip gripper, all compared against a ‘control group’ where bonefish were handled only with bare hands Bonefish held with a lip-griping device either vertically or horizontally were prone to injury – 90% of fish had at least minor injuries (which included holes through the tissue of the lower jaw where the lip gripping device was placed) and 35% of fish had major injuries (including broken mandible and separated tongue). Conversely, only one of the fish held by hand had a minor injury and none had major injuries. All fish survived for 48 hours after being handled, but the authors did not monitor for long-term survival or feeding ability. Injuries sustained to bonefish using a mechanical lip-gripping device. Link to report. Barramundi In 2009, a different group of scientists looked at how lip grippers compared to nets for holding barramundi (an Australian sportfish). They compared barramundi held in a net with those held vertically by a lip gripper, as well as those held horizontally with a lip gripper and one hand supporting the midsection of the fish. They found that all fish held vertically and 81% of fish held horizontally had holes in their lower jaws. However, no fish had severe injuries as was seen with bonefish. Furthermore, all fish resumed feeding within 3-5 days and all holes healed within three weeks. The scientists also took x-rays of some of the barramundi to see if holding them with lip grippers had any effect on their vertebral alignment. They found that holding barramundi vertically, and to a lesser extent holding them horizontally with the lip gripper causes vertebral separation. None of the vertebrae separations recovered after three weeks. Being water dwellers where the water supports much of their body weight, holding fish in the air has the possibility of causing damage or separation to vertebrae. Florida Largemouth Bass The most recent study on lip grippers was conducted on Florida largemouth bass and examined the differences between holding largemouth bass vertically with a lip gripper, by hand on the lower jaw using a tilted grip, and using a two-handed hold. They found no difference in feeding behavior, survivorship, or rates of injury between any of the three methods of holding bass. They did, however, find that largemouth bass that were held with the lip-gripping device took longer to recovery than other fish. Why are these studies important to anglers? • These three studies constitute a start to the much-needed research on lip-gripping devices, and given the diversity of these devises and the species they are used on, clearly there is more work to be done. • What these studies do show is that there is a wide variation in how lip-gripping devices affect the incidence of injury on different fish species. • What I could not find are any studies that examine repeated use of lip grippers, long-term affects on fish, or compare injuries from lip grippers to those caused by nets. • If tackle manufactures want to make claims that their lip grippers and other fish handling products do not harm fish, they should consider independent testing.